Used for neutralising systemic envenoming by members of the Australian brown snake group. It is made from horse IgG. Each ampoule contains 1000 units of neutralising capacity against the target venoms. One unit of antivenom activity should neutralise 0.01mg of dried venom from the species of animal against which the antivenom has been raised. Average volume per ampoule is 4.5-9mL. The immunising venom used is common brown snake venom. Brown snakes are the most common cause of snakebites and snakebite deaths in Australia. The fangs are small; average fang length in adults is only 2.8mm. Compared to many other dangerous snakes, they generally produce little venom, though the venom is very potent. There are several species, the most important medically being the eastern or common brown, the western brown or gwardar and the dugite. They vary in length up to 2m, rarely more. Colouration is very variable; they may be brown, orange-red, grey, almost black, unbanded, speckled, banded, or black headed. Juveniles have distinctive head and neck markings, with a black mark on the top of the head, followed by a brown to orange band, then a black band. These baby brown snakes typically hatch around February/March and are about 25cm long. Brown snakes are common throughout mainland Australia, in essentially all habitats, including urban areas. They are not present in Tasmania or the islands off the southern coast of Australia, such as Kangaroo Island (SA). They are relatively common in some urban and metropolitan areas. Hundreds of brown snakes are removed from houses and other properties each year in some capital cities and >10% of these snakes are found inside the house! The venom is multicomponent and includes powerful presynaptic neurotoxins, procoagulants and possibly both cardiotoxins and direct nephrotoxins. There is no myolytic activity. The venom of the common brown snake is the second most potent snake venom in the world. Perhaps because of their small fangs and relatively small amount of venom available, many brown snake bites are minor, not requiring antivenom therapy. Of course, this is not known initially, so all bites should be treated as potentially lethal. In the days prior to antivenom therapy less than 10% of brown snake bites were fatal. However, this low rate of lethality is more than compensated by the frequency of bites and when a brown snake does inject plenty of venom, it is both very toxic and rapid acting. A typical brown snake bite is either painless or almost painless. The tiny fangs often leave only faint puncture or scratch marks, without local redness, bruising or swelling. Indeed, the bite can be hard to see without a magnifying glass. Do not be fooled; even such an apparently trivial looking bite can result in lethal envenoming, particularly in young children. If a significant amount of venom has been injected, then the patient may develop local draining lymph node tenderness/swelling, a persistent ooze from the bite site, headache, nausea/vomiting, abdominal pain, severe coagulopathy and sometimes, kidney damage. Paralysis is also possible but is only rarely seen, even with otherwise severe envenoming. Myolysis does not occur. In young children and occasionally in adults, early collapse ± grand mal convulsions may occur. In cases where there has been massive envenoming such as with multiple bites, the early collapse may be associated with cardiac arrhythmias and even cardiac arrest, probably secondary to short-lived coronary vessel occlusion by thrombi generated by venom procoagulants. However, it is coagulopathy which is the hallmark of brown snake envenoming. There is consumption of circulating fibrinogen, with production of breakdown products. The defibrination may be total within 30 mins of the bite. Fortunately, platelets are often not affected, at least initially. In these patients with complete defibrination, the INR will be >12 (actually infinity), the fibrinogen unmeasurably low and degradation products massively elevated. The patient is at risk of major haemorrhage and fatal intracerebral haemorrhages do occur. Anything causing hypertension is to be avoided. Antivenom is the best way to reverse this devastating coagulopathy but large amounts may be required. FFP is usually not needed and is contraindicated until all circulating venom has been neutralised with adequate antivenom, except if there is severe, life threatening haemorrhage. For brown snake bites, the majority of patients will not need antivenom. However, if there is any evidence of either coagulopathy or kidney damage, antivenom is required. If systemic symptoms and coagulopathy are only mild (say INR >1.5 but <2.0), then an initial dose of 2 vials of CSL Brown Snake Antivenom may be sufficient. If, however, there is major coagulopathy, commence with 4 vials of antivenom and expect to give 2 to 6 more vials over the next few hours, titrated against coagulation results. Wait 3 hours before definitive retesting of coagulation to determine if more antivenom is required. 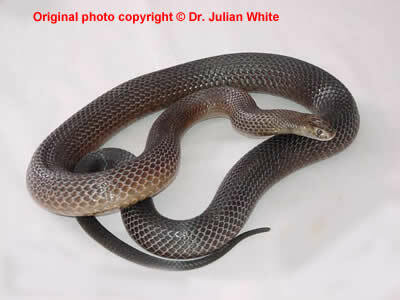 Kidney damage is the other major clinical problem of brown snake bite. It is mostly seen in adults, especially if they have had alcohol prior to the bite. Causation is uncertain, probably multifactorial, but may include direct nephrotoxic action of the venom, though this is, as yet, unproved. Early generous iv hydration in all cases of brown snake bite may reduce the chance of major kidney damage. As with most antivenoms, CSL Brown Snake Antivenom should only be given if there is clear evidence of envenoming. See potential contraindications. It should be given intravenously, through a drip set. If possible, dilute antivenom up to 1 in 10, with an isotonic crystaloid solution (eg saline, Hartmans or dextrose). In general, each vial/dose should be run over 15-30 minutes. Prior to commencing antivenom therapy, make sure everything is ready to treat anaphylaxis, should this occur. Specifically, have adrenaline ready to give. If there is an infusion pump available, have this set up to run through a side arm of the drip set, with a solution of dilute adrenaline (eg 6mg adrenaline in 100mL of saline or 5% dextrose, or equivalent dilution). Clearly mark this pump, so that it is not accidentally started. Any patient who has received antivenom may develop serum sickness, from 4 to 14 days later. Before leaving hospital, they should be advised of the symptoms of serum sickness, such as rash, fever, joint aches and pains, malaise, and told to return immediately for review and probable commencement of oral steroid therapy. If there was major envenoming, organise follow up. This is usually not necessary for minor envenoming. If several bottles of antivenom have been given to the patient (eg >4) it may be useful to give a 5 day course of oral steroids as prophylaxis for serum sickness (eg 30-50mg daily of prednisolone, for adults).